Three-time major winner Padraig Harrington thinks he has found the "mental edge" he has been missing after ending a seven-year wait for a title on either the PGA Tour or European Tour. 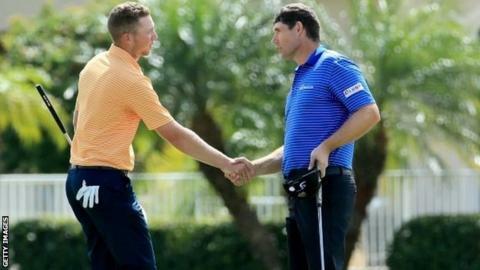 The 43-year-old Irishman beat American rookie Daniel Berger, 21, in a play-off to win the rain-delayed Honda Classic. Harrington sealed victory on the second extra hole and qualifies for the Masters after missing out in 2014. "Hopefully this isn't an isolated win," said the Dubliner. "I really do believe in myself. I think I've found that mental edge that I've been lacking the last number of years." Berger posted a six-under 64 to tie with Harrington, who won the US PGA in 2008 and the Open in 2007 and 2008, on six under after a major thunderstorm on Saturday pushed the finish back to Monday morning. Overnight leaders Ian Poulter and Paul Casey finished joint third on five under, alongside Scotsman Russell Knox. Poulter found the water five times as he shot a four-over 74. Padraig Harrington will play at Augusta in April by virtue of his victory in the Honda Classic, with winners of PGA Tour events between each Masters receiving an invitation to the next tournament. Harrington missed his first Masters since he made his debut in 2000 last year. The win lifts Harrington back up to 82nd in the world rankings after beginning the tournament 297th. The former world number two trailed by four shots going into Monday but surged into contention with four consecutive birdies at 11, 12, 13 and 14. He double bogeyed the 17th but sank a 15-foot birdie putt on 18 for a 70. What have we learned at World Cup? Read more on Cricket World Cup 2015: Spinners, streakers and were England right?